Pierce Brosnan swaps James Bond’s smoothness for a savage side in The Son, a wild west saga that spans the generations. If you’re looking to dissect toxic masculinity, the western is the place to be. The Wild West might be where a man can stand tall, but over the last half century the western has repeatedly shown those men as flawed, violent, brutal thugs driven more by inner demons than any idea of right and wrong. And while all manner of prestige television series have taken that critique of masculinity into the present day and beyond, in The Son the brooding anti-hero has found his way home. Based on the Pulitzer-prize nominated novel by Philipp Meyer, this ten-part series runs across two parallel timelines (the novel has three: it looks like the recently announced second season will introduce the more modern-day strand of the story). In 1849, Eli McCullough (Jacob Lofland) and his brother Martin are the only survivors when his family is attacked by Comanches. Eli figures out a way to survive with the tribe and ends up as basically a slave to Toshaway (Zahn McClarnon, from Fargo); Martin… isn’t quite so lucky. In 1915 the elderly but feisty Eli (Pierce Brosnan), now also known as “The Colonel” and proudly announcing that he shares his birthday with the great state of Texas itself, rules over a large family. He also holds sway over an even larger Texas cattle ranch, which he – and, initially at least, not that many others – is convinced contains vast oil riches. The early timeline is an often brutal tale of Wild West survival, as Eli – whose Indian name is “Pathetic White Boy” – slowly finds a place in the tribe that murdered his family. Gradually he forms a relationship with Prairie Flower (Elizabeth Frances), which puts him at odds with rival Charges the Enemy (Tatanka Means). His new people may often be violent, but it’s clear that this is a violent place and time; whatever side he’s on, he’s going to end up shedding the other side’s blood. The older Eli initially seems secure in his power, but the foundations of his Rio Grande empire are quickly revealed to be shaky. 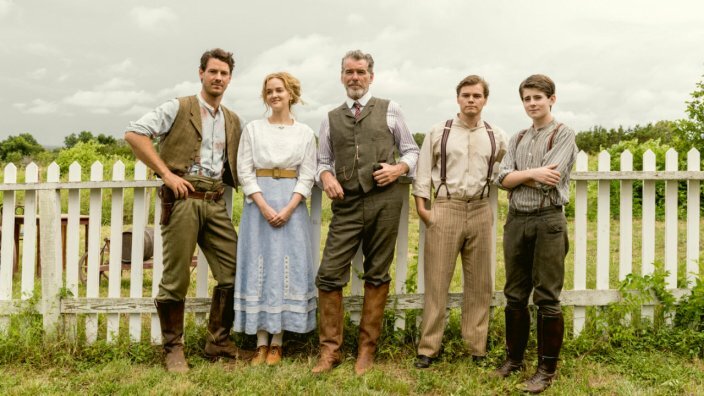 His drive to find oil on his property has put it in financial strife, and while his elder son Phineas (David Wilson Barnes) tries to find investors to prop up the ranch, younger son Pete (Henry Garrett) is constantly struggling to be the heart and conscience of the family – traits his father seems perfectly happy to get along without. It’s a gorgeous-looking series, with plenty of sweeping shots of the beautiful Texas countryside that provides an often ironic backdrop for moments of harsh violence. With such a large cast, it takes a little while to sort everyone out; in the earlier timeline it doesn’t take long to figure out who’s important in the tribe, but in 1915 not only do both brothers have their own large families (who presumably play a bigger role in the next season’s future timeline), there’s a whole rival ranch run by Pedro Garcia (Carlos Bardem), whose daughter once had a thing with Pete. The Garcia ranch also stands between the McCullough property and the Mexican border; with tensions rising between the two countries (1915 was the start of what would be known as the Bandit War), Eli’s fondness for violence, torture, and fanning the flames of racial hate makes him a little too well-suited for the times. And this series goes out of its way to sketch in the times’ various cultural and social fault lines: the various Native American tribes are at war with each other as well as the settlers, while in 1915 the scars of the Civil War remain fresh and the Mexicans still see Texas as property it’s their duty to reclaim. Often with this kind of series it’s easy to dismiss flashbacks as a simplistic way to show character: Eli’s violent past has clearly made him a violent man. But it doesn’t take long to realise there’s more going on here. If his future brutality was born when his family was killed by the Comanches, then his stay with them should just be a long con as he bides his time looking for revenge. It’s clearly not; his feelings for Prairie Flower are a welcome thread of human warmth running throughout the series. The flipside of this is that the older Eli’s violent nature is repeatedly shown – despite Pete’s best efforts to civilise him – to be perfectly in synch with the world he lives in. History here is cyclical: while the open brutality of the settler days may have passed, the world it created remains a violent, savage place. The Son says a world born in violence will retain that violence; is Eli a product of his times, or a man who uses his times to excuse the darkness that was always within him?